Posters are an integral part of any film’s promotion. The South Indian Film posters always stood out for its unique and interesting designs. Here is an article that was published in today’s Metro plus, a supplement of The Hindu (Poster boys – The Hindu). The article talks about the men who work all night pasting these posters in our city walls. 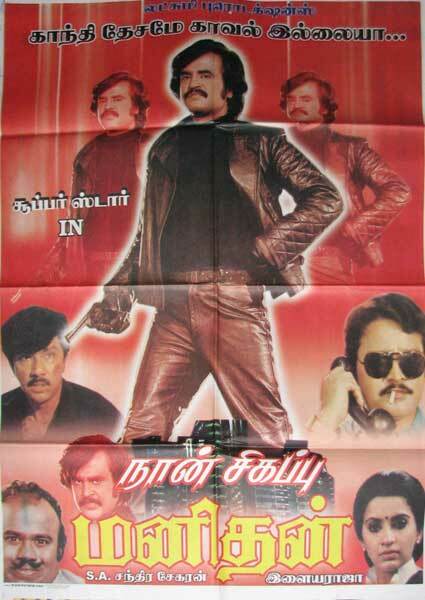 While we are talking about posters here are images of posters from two famous tamil films taken from our archives. This entry was posted in Tamil Cinema and tagged Arts, Chennai, Entertainment, Film poster, Hindu, movie promotion, Movies, Poster, posters in Chennai, Rajani films, Vijaykanth. Bookmark the permalink.